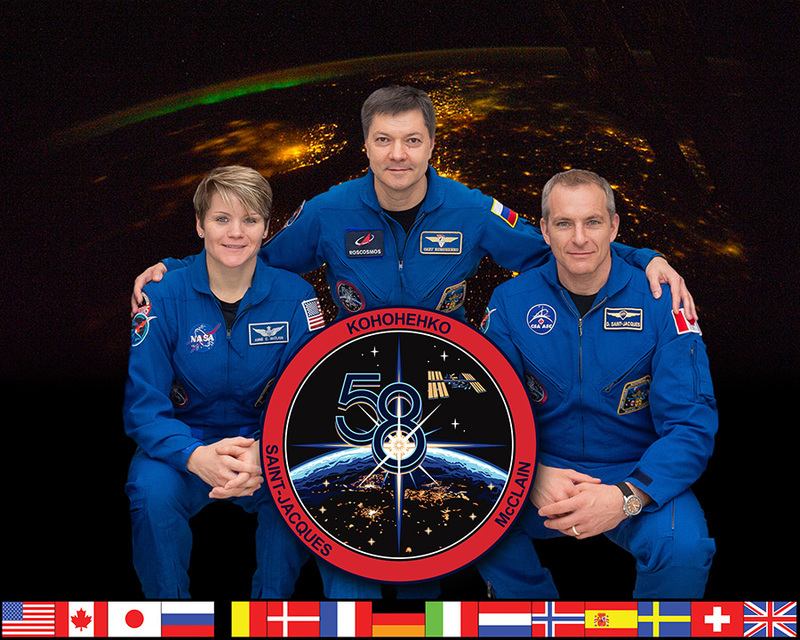 The official Expedition crew portrait with (from left) NASA astronaut Anne McClain, Roscosmos cosmonaut Oleg Kononenko and astronaut David Saint-Jacques of the Canadian Space Agency. Three people from the U.S., Canada and Russia are orbiting Earth today getting ready to observe Christmas and experience New Year’s Eve from space aboard the International Space Station. Back on Earth, another three station crew members have returned to their home bases just 24 hours after completing a 197-day mission aboard the orbital lab. The first time three humans spent Christmas in space was 50 years ago in 1968 during Apollo 8 and was also the first time a crew orbited the Moon. 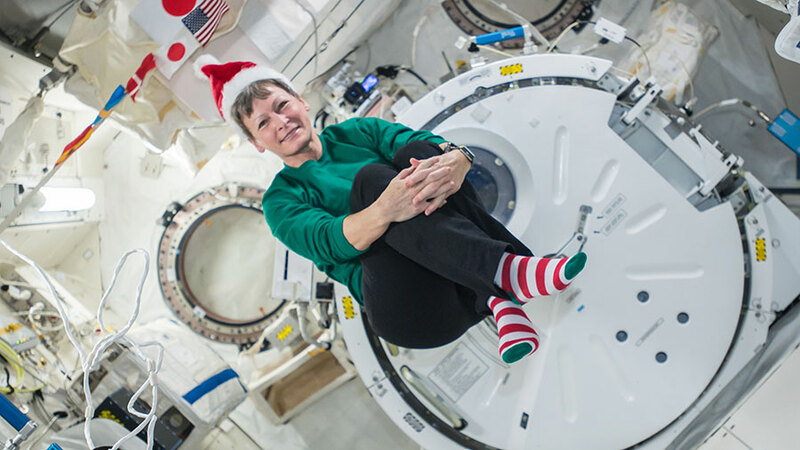 This Christmas astronauts Anne McClain of NASA and David Saint-Jacques of the Canadian Space Agency with cosmonaut Oleg Kononenko of Roscosmos will be soaring about 250 miles above the Earth’s surface in a much larger spacecraft. The Expedition 58 trio will share a traditional meal aboard the orbital lab, share gifts and call down to family during their off-duty day. Kononenko is beginning his fourth mission on the station and will spend his second Christmas in space. McClain and Saint-Jacques are getting used to life in space for the first time and will return to Earth in June with Kononenko. NASA astronaut Serena Auñón-Chancellor returned to Houston late Thursday just one day after landing in Kazakhstan wrapping up her six-and-a-half month stay aboard the orbital lab. She parachuted to Earth inside the Soyuz MS-09 spacecraft with her Expedition 57 crewmates Alexander Gerst of ESA (European Space Agency) and Sergey Prokopyev of Roscosmos. 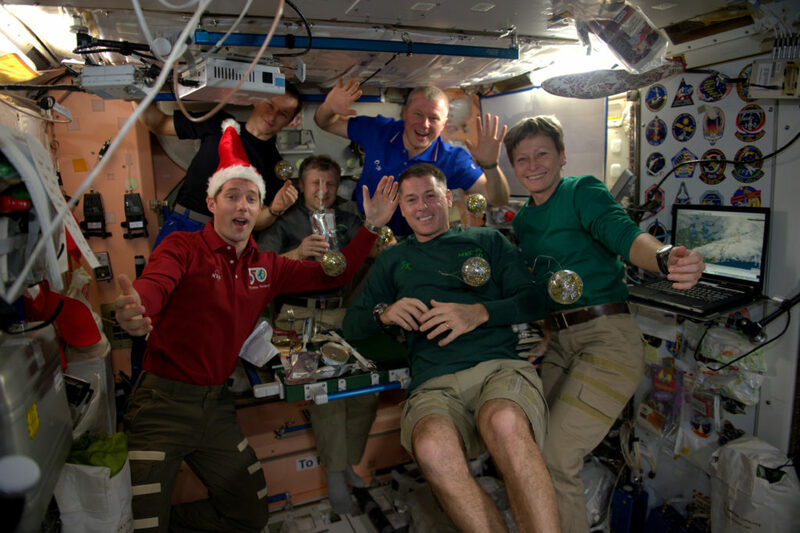 Aboard the International Space Station, Expedition 50 Flight Engineer Peggy Whitson of NASA sent holiday greetings and festive imagery from the Japanese Kibo laboratory module on Dec. 18. The six-member Expedition 50 crew from France, Russia and the U.S. is heading into the holiday weekend with spacesuit checks and eye studies. The international crew will share a Christmas meal, enjoy a light-duty weekend and take Dec. 26 off. Commander Shane Kimbrough scrubbed cooling loops and tested the water in a pair of U.S. spacesuits today. Kimbrough and Flight Engineers Peggy Whitson and Thomas Pesquet are getting ready for a pair of spacewalks on Jan. 6 and 13. The spacewalks, in conjunction with remote robotics work, will complete the replacement of old nickel-hydrogen batteries with new lithium-ion batteries on the station’s truss structure. 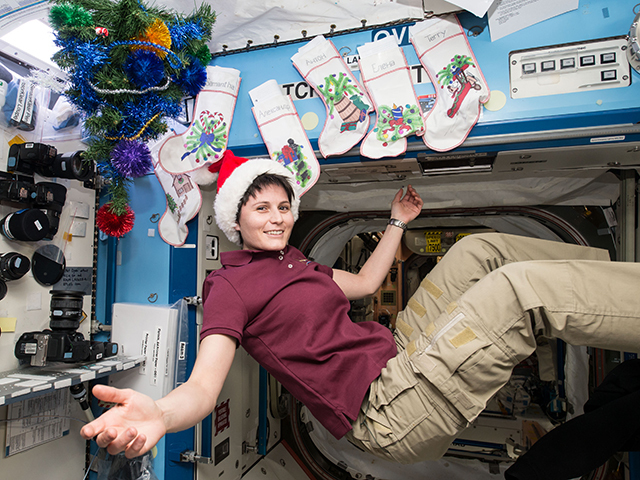 Whitson, who is spending her second Christmas in space, and Pesquet drew blood, urine and saliva samples for the Fluid Shifts study. That experiment investigates the upward flow of body fluids in space potentially causing lasting vision changes in astronauts. In the Russian segment of the International Space Station, the three cosmonauts primarily worked on maintenance tasks and science work. Oleg Novitskiy worked on communications gear and experimented with space photography techniques. Sergey Ryzhikov worked on water transfers and a cardiac study. Andrey Borisenko worked on life support equipment before studying how a crew member learns to orient themselves in microgravity.